Not to be confused with their edible, terrestrial counterparts, hot DOGs (hot dust obscured galaxies) are hyperluminous galaxies first detected by the WISE mission in the infrared. Most of these are located at a redshift of z~2-3, which also corresponds to the peak era of star formation in the Universe. These galaxies are heavily obscured with dust and gas, and are thus difficult to observe in visible wavelengths. However, they do emit detectable amounts of radio and microwave emission. Multiwavelength data suggest that hot DOGs contain active galactic nuclei (AGN), and are believed to be a brief phase in the evolution of galaxies transitioning from starburst to AGN dominated phases. 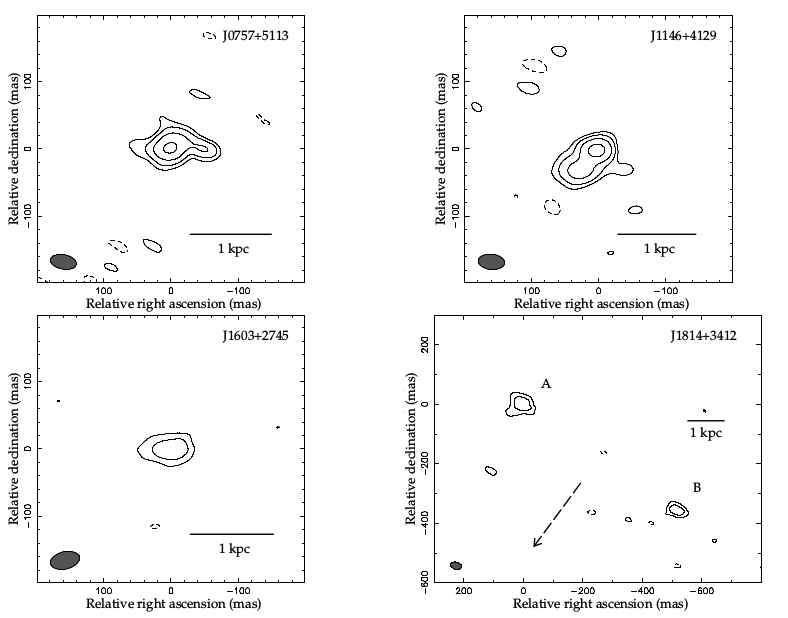 In this paper, the authors observe four different hot DOGs (which have been previously identified by the WISE survey) using very long baseline interferometry (VLBI) on the European VLBI network. In this kind of interferometry, a radio source is observed from at least two widely separated locations on Earth, and the resultant signals are combined with the time delay information of the observations. This produces an image that is equivalent to an image collected by a telescope the size of the maximum separation of the detectors. Interferometry is especially important for radio astronomy, as the long wavelengths of radio signals require a very long baseline to achieve a reasonable resolution due to the effects of diffraction. The radio emission from these hot DOGs is not significantly affected by dust obscuration. Given that this relatively weak radio emission is detectable from such high redshifts, the most likely candidate for the central engine driving the emission is an AGN. Fig. 1 shows the radio contours of these objects. Fig. 1: Radio contour images of the four observed hot DOGs at 1.7 GHz. The bottom right object shows a symmetric double structure, which is believed to originate from radio emission produced by a symmetric, bipolar outflow driven by an AGN. In two of the observed hot DOGs, the measured radio flux density is much smaller than the total flux density (previously measured by the FIRST survey). This suggests that only a part of the total flux is detected by the observable field of view of the VLBI and that the object is extended on larger angular scales. This discrepancy in flux density is presumed to be due to star formation and AGN activity that is occurring on angular scales larger than what the VLBI can probe. The authors infer a star formation rate from these measurements that reaches up to thousands of solar masses per year. In comparison, our Milky Way is believed to form about 1 solar mass per year. These observations are consistent with the idea that hot DOGs host both star formation activity and AGN activity. Hot DOGs are important clues in understanding the onset of star formation and AGN accretion activity at high redshifts, as these two phases are believed to be initiated when gas-rich galaxies collide and merge. A galaxy merger provides an impetus for star formation to peak as gas is compressed to higher densities, and the abundance of gas also feeds the central black hole engine. To better understand the transition between the starburst-dominated and AGN-dominated phases of these objects, we need higher resolution radio data from future observations to resolve the spatial structures of these hot DOGs.